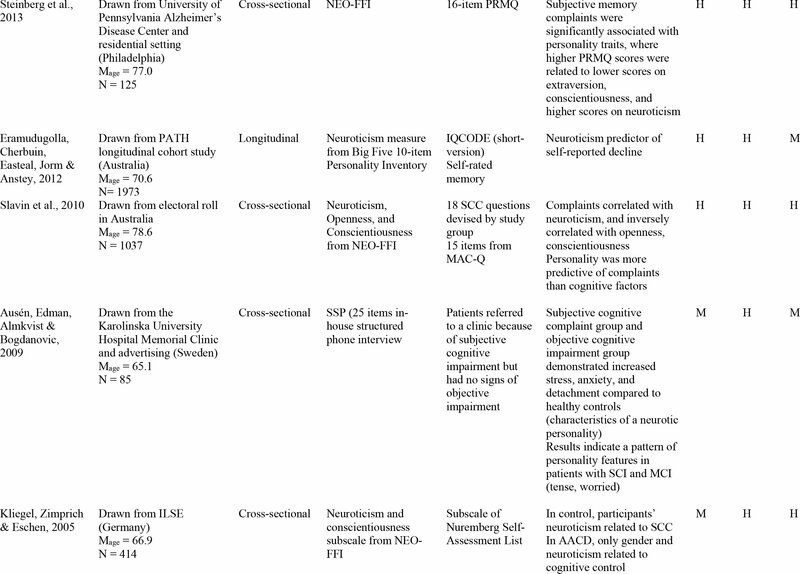 Subjective cognitive impairment (SCI), or the perception of cognitive problems (Jessen et al., 2010), is of increasing scientific interest given its association with a substantially higher risk for future cognitive decline and Alzheimer's disease (AD; Jessen, Wolfsgruber, et al., 2014 ; Reisberg, Shulman, Torossian, Leng, & Zhu, 2010). However, an endorsement of SCI may reflect a variety of experiences, including awareness of age-related cognitive change, worry about memory problems, or a preclinical stage of AD during which subtle changes are not yet detectable by objective cognitive testing (Jessen, Amariglio, et al., 2014; Rabin et al., 2015; Stewart et al., 2011). The heterogeneity of self-reported cognitive problems has precipitated extensive interest in better characterizing and measuring the SCI experience to determine its potential for identifying individuals at higher risk for mild cognitive impairment (MCI) and AD (Jessen, Amariglio, et al., 2014; Rabin et al., 2015). MCI is considered a “pre-dementia” stage on the cognitive decline continuum and one key criterion is the report of cognitive problems by the patient or an informant (Peterson et al., 2017). Recent practice guidelines (Peterson et al., 2017) recommend that an evaluation for MCI be conducted when an older adult reports cognitive concerns (i.e., SCI) due to the higher risk for AD among individuals with MCI (Langa & Levine, 2014). However, many older adults with MCI will not progress to AD; some remain stable and others revert to normal cognition over time (Ganguli et al., 2018). Therefore, much remains to be understood regarding the factors that influence reporting of SCI and how SCI relates to cognitive decline and AD risk. Personality is a well-established contributor to a variety of health and well-being outcomes in older adults, including subjective health and mood (Costa & McCrae, 1992; Friedman, Kern, & Reynolds, 2010; Kliegel, Zimprich, & Eschen, 2005; Pearman, Hertzog, & Gerstorf, 2014). It is most commonly operationalized using the five-factor model (the “big five”): neuroticism, extraversion, openness, agreeableness, conscientiousness. Personality is often associated with the reporting of cognitive problems (Comijs, Deeg, Dik, Twisk, & Jonker, 2002; Hill et al., 2016; Rowell, Green, Teachman, & Salt-house, 2016; Snitz et al., 2015) and is therefore considered a confounding factor in existing research examining the SCI–AD link. However, the oft-cited association between SCI and personality, in particular neuroticism (Ausen, Edman, Almkvist, & Bogdanovic, 2009; Luchetti, Terracciano, Stephan, & Sutin, 2016; Steinberg et al., 2013), has yet to be systematically evaluated. Individuals with a higher level of neuroticism are more likely to report anxiety, have higher feelings of self-consciousness, and worry more (Costa & McCrae, 1992) compared to individuals with lower levels of neuroticism. Therefore, they may experience more distress due to memory problems, such as forgetting a name or event, and may be more likely to remember these instances when responding to questions about SCI. In addition, this distress may make them more likely to report and seek medical help for their concerns (Costa & McCrae, 1985). Alternatively, individuals with a lower level of neuroticism may experience the same memory lapse but may be less likely to reflect on it as a worrisome symptom and report it when asked. Beyond neuroticism, other personality traits are also associated with self-rated health and, potentially, reports of SCI. Extraversion is the tendency to be sociable, and individuals with lower levels of extra-version tend to be more pessimistic (Costa & McCrae, 1992), whereas individuals higher in extraversion tend to rate their health more positively (Löckenhoff, Sutin, Ferrucci, & Costa, 2008). Openness measures the extent to which an individual is curious, creative, and imaginative (Kwantes, Derbentseva, Lam, Vartanian, & Marmurek, 2016), and individuals with higher levels of openness are more likely to participate in activities that improve cognitive health (Booth, Schinka, Brown, Mortimer, & Borenstein, 2006). Conscientiousness measures the extent to which an individual is organized, self-motivated, and likely to follow through on tasks (Kwantes et al., 2016), and individuals with lower levels of conscientiousness practice fewer healthy behaviors (O'Connor, Conner, Jones, McMillan, & Ferguson, 2009). Agreeableness measures individuals' preferences for collaboration versus cooperation; its associations with health are inconsistent (Friedman et al., 2010). It is unclear whether older adults with certain personality traits (e.g., higher neuroticism or conscientiousness) are more likely to report SCI due to health-related concerns in general, or if they are inherently more sensitive to subtle cognitive changes (Reid & Maclullich, 2006). Understanding such tendencies is critical to accurate interpretation of the meaning of SCI reports among older adults across clinical and research settings. Ultimately, articulating the link between SCI and AD relies, in part, on a thorough understanding of the individual factors that contribute to an endorsement of SCI, such as the influence of certain personality traits (Jessen, Amariglio, et al., 2014). The purpose of the current systematic review was to thoroughly examine the relationships between the “big five” personality traits and SCI in older adults without AD or other dementias, including identifying which personality traits are associated with the presence of SCI or a higher level of SCI. The Preferred Reporting Items for Systematic Reviews and Meta-Analyses (PRISMA) guided this systematic review (Moher, Liberati, Tetzlaff, & Altman, 2009). 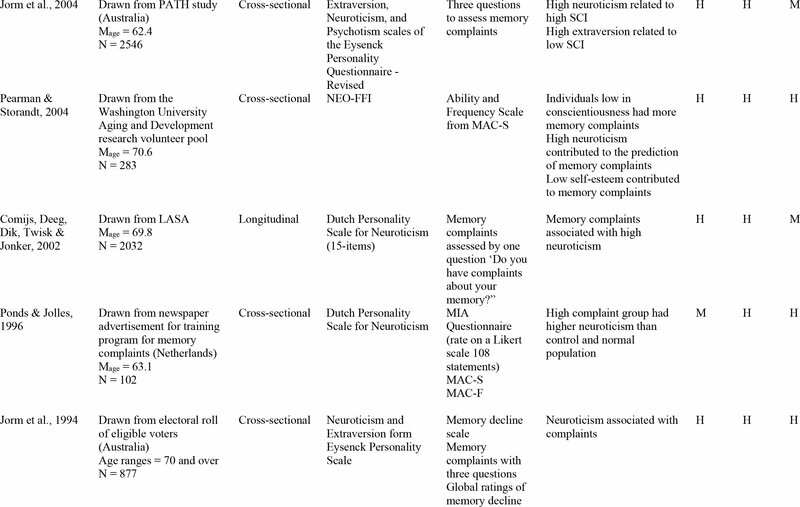 In May 2018, a comprehensive literature search was performed in PubMed, Web of Science, and CINAHL databases using the following terms: [Personality OR neuroticism OR neurotic] AND [“subjective cognitive” OR “subjective memory” OR “cognitive complaints” OR “memory complaints” OR “cognitive concerns” OR “memory concerns” OR “cognitive difficulties” OR “memory difficulties” OR “cognitive failures” OR “memory failures” OR “perceived forgetfulness” OR “cognitive functioning”]. Articles were examined for the following inclusion criteria: available in English, measurement of SCI, measurement of at least one personality trait of interest (i.e., neuroticism, extraversion, openness, agreeableness, or conscientiousness), and a mean sample age of 60 or older. Studies examining SCI in individuals with AD or other dementia were excluded. No limits were placed on year of publication. Opinion articles, editorials, literature reviews, and dissertations were excluded. A critical appraisal of each article that met eligibility criteria was conducted using the weight of evidence (WoE) framework (Gough, 2007; Weed, 2005). 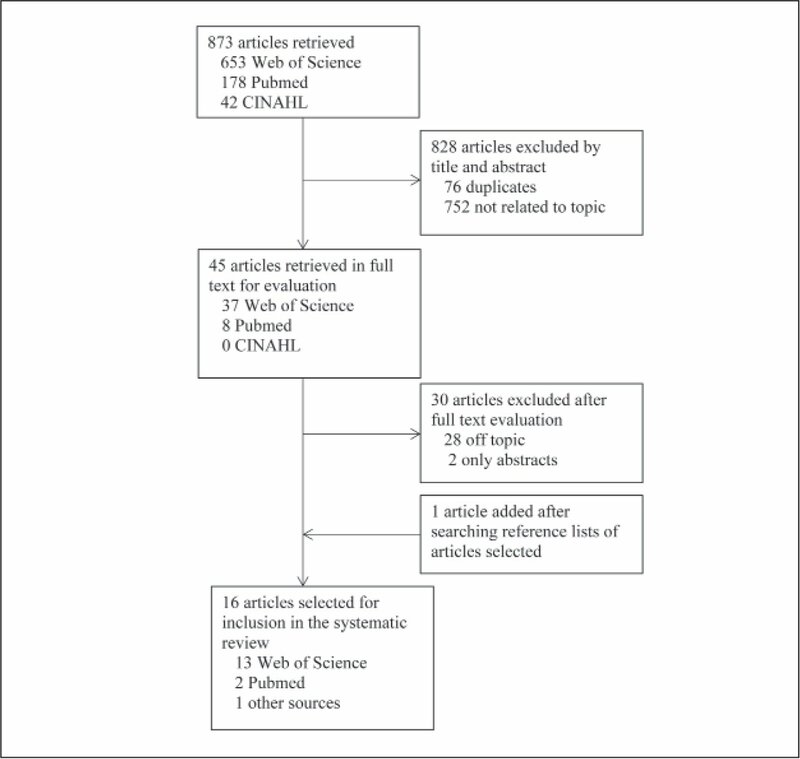 Each article was rated for methodological quality (WoE A), methodological relevance (WoE B), and topic relevance (WoE C) as low, medium, or high for each criterion (Table 1). A low methodological relevance indicated that the article did not examine the associations of interest, and therefore any article given this rating was excluded. Two reviewers evaluated all articles with 83.3% agreement across WoE ratings; discrepancies were discussed among all authors to reach consensus. The PRISMA flow diagram (Figure 1) shows the process of the selection of articles included in the review. After duplicates were removed, 797 articles were found using the initial search strategy and a total of 16 articles ultimately met eligibility criteria. Table A (available in the online version of this article) provides a summary of the reviewed articles along with WoE ratings. PRISMA flow chart (Moher et al., 2009) showing the search and selection process for articles used in the current review. Of the 16 articles included in the review, 12 were cross-sectional (Arbuckle, Gold, & Andres, 1986; Ausén et al., 2009; Jorm et al., 2004; Jorm et al., 1994; Kliegel et al., 2005; Merema, Speelman, Foster, & Kaczmarek, 2013; Pearman & Storandt, 2004; Ponds & Jolles, 1996; Rowell et al., 2016; Slavin et al., 2010; Steinberg et al., 2013; Studer, Donati, Popp, & von Gunten, 2014) and four included longitudinal assessments (Comijs et al., 2002; Eramudugolla, Cherbuin, Easteal, Jorm, & Anstey, 2012; Luchetti et al., 2016; Pearman et al., 2014). However, although Eramudugolla et al. (2012) included cross-sectional as well as longitudinal data, SCI and personality were measured only cross-sectionally. Sample sizes ranged from 85 (Ausén et al., 2009) to 13,987 (Luchetti et al., 2016) participants. Five studies were rated as medium methodological quality (WoE A) due to smaller sample sizes; the remaining 11 were rated high in methodological quality. 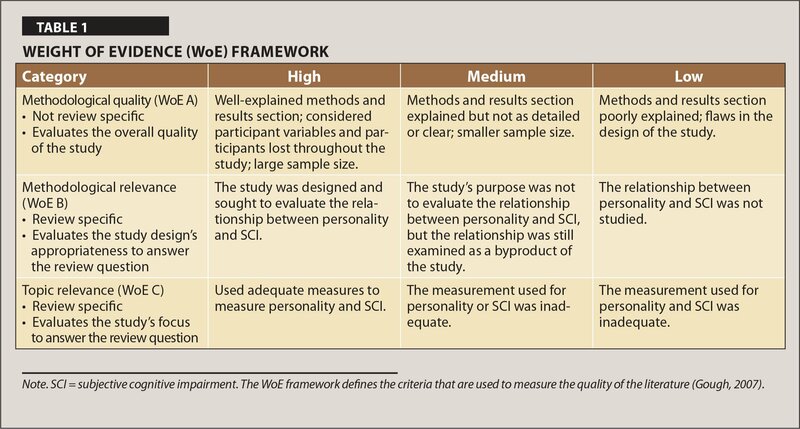 Three studies received a medium methodological relevance rating (WoE B) due to the use of personality or SCI measures that were not standardized or lacked psychometric evidence of validity and reliability. Ten studies included research questions directly related to the current review and were rated as having high topic relevance (WoE C). 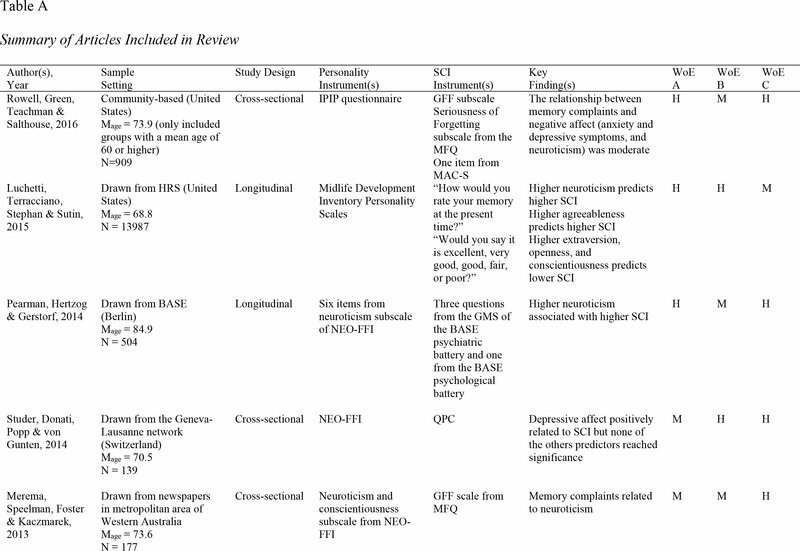 A summary of relevant findings in the articles reviewed is shown in Table 2. Across all studies, the most consistent evidence supported a relationship between higher neuroticism and SCI, with 88% of the reviewed articles (n = 14) identifying a significant association. For the seven articles reviewed that measured conscientiousness, 57% identified a significant association between higher conscientiousness and lower SCI. Across the eight articles that studied extraversion, the five articles that studied openness, and the four articles that studied agreeableness, there was no convergence of evidence supporting significant relationships between these traits and SCI, with most articles identifying no relationship (62.5%, 60%, and 75%, respectively). Most studies measured level of SCI, operationalized with one to three items using Likert-type ratings (Arbuckle et al., 1986; Luchetti et al., 2016; Pearman et al., 2014) or standardized scales (Jorm et al., 1994; Kliegel et al., 2005; Merema et al., 2013; Pearman & Storandt, 2004; Rowell et al., 2016; Slavin et al., 2010; Steinberg et al., 2013). The remaining studies used presence of SCI as the indicator of interest (Ausén et al., 2009; Comijs et al., 2002; Eramudugolla et al., 2012; Ponds & Jolles, 1996; Studer et al., 2014). Presence of SCI was defined in a variety of ways, including established cut-offs on clinical measures (Eramudugolla et al., 2012), interference with daily life (Jorm et al., 2004), and clinic referrals (Ausén et al., 2009). One study (Ponds & Jolles, 1996) used high and low cognitive complaint groups as well as a standardized questionnaire to examine relationships among SCI and personality. Despite the different approaches to SCI measurement, results tended to remain consistent across studies. For example, higher levels of neuroticism were associated with the presence of SCI (Ausén et al., 2009; Comijs et al., 2002; Eramudugolla et al., 2012; Jorm et al., 2004; Ponds & Jolles, 1996), as well as a higher level of SCI (Jorm et al., 1994; Kliegel et al., 2005; Luchetti et al., 2016; Merema et al., 2013; Pearman et al., 2014; Pearman & Storandt, 2004; Rowell et al., 2016; Slavin et al., 2010; Steinberg et al., 2013). Similarly, the majority of studies found no association between agreeableness and presence of SCI (Studer et al., 2014) or level of SCI (Pearman & Storandt, 2004; Steinberg et al., 2013). Three studies examined the relationship between SCI and personality longitudinally (Comijs et al., 2002; Luchetti et al., 2016; Pearman et al., 2014)—specifically, whether personality was related to changes in SCI over time. In all three studies, higher neuroticism was related to greater likelihood of the presence of SCI (Comijs et al., 2002) or greater levels of SCI (Luchetti et al., 2016; Pearman et al., 2014) over time. Luchetti et al. (2016) also considered the role of the remaining four personality traits. Individuals higher in extraversion, openness, and conscientiousness reported lower SCI over time, whereas individuals higher in agreeableness reported higher SCI over time. Sample sizes ranged from 85 to more than 13,000 participants. Sample size appears to be an important consideration: the five studies with samples >1,000 participants (Comijs et al., 2002; Eramudugolla et al., 2012; Jorm et al., 2004; Luchetti et al., 2016; Slavin et al., 2010) were more likely to find significant effects relating all personality traits to SCI compared to studies with fewer participants (Arbuckle et al., 1986; Ausén et al., 2009; Jorm et al., 1994; Kliegel et al., 2005; Merema et al., 2013; Pearman et al., 2014; Pearman & Storandt, 2004; Ponds & Jolles, 1996; Rowell et al., 2016; Steinberg et al., 2013; Studer et al., 2014). Most studies that examined the personality traits of agreeableness, openness, and conscientiousness tended to have <1,000 participants, suggesting that part of the difficulty of identifying relationships between SCI and these traits may have to do with a lack of large population-based studies with greater variability. Mean sample age ranged from 62.4 to 84.9 years, and results remained relatively consistent among studies regardless of the average age (or age range) of participants. For example, in 10 studies with a mean or median age >70 years, 80% found that higher neuroticism was associated with a higher level of SCI (Jorm et al., 1994; Merema et al., 2013; Pearman et al., 2014; Pearman et al., 2004; Rowell et al., 2016; Slavin et al. 2010; Steinberg et al., 2013) as well as presence of SCI (Eramudugolla et al., 2012). The two remaining studies found the absence of a relationship between neuroticism and SCI (Arbuckle et al., 1986; Studer et al., 2014). The other six studies were consistent in their findings: higher neuroticism was associated with a higher level of SCI (Jorm et al., 2004; Kliegel et al., 2005; Luchetti et al., 2016) as well as presence of SCI (Ausén et al., 2009; Comijs et al., 2002; Ponds & Jolles, 1996). Similarly, three studies with participants with a mean or median age >70 years found the absence of a relationship between extraversion and SCI (Arbuckle et al., 1986; Pearman et al., 2014; Studer et al., 2014), whereas two studies with a sample mean or median age <70 years found the absence of a relationship between extraversion and SCI (Ausén et al., 2009; Jorm et al., 2004). The current systematic review found relatively consistent associations between higher neuroticism and presence of SCI as well as positive associations between higher neuroticism and higher levels of SCI. Neuroticism is often considered a contributor to cognitive complaints (and health-related complaints in general; Friedman et al., 2010), so this was not an unexpected finding. However, the review highlights the need to consider a more holistic view of personality's contribution to reports of SCI: neuroticism is not the only contributing factor. Conscientiousness was also associated with SCI in more than one half of the studies reviewed, and associations among all personality traits were more likely to be found in larger studies. It is important to highlight that inconsistencies occurred across studies even for these theoretically relevant traits. Neuroticism and conscientiousness were not significantly associated with SCI in two and three studies, respectively. Because methodological quality of these studies was rated medium or high in all instances, differences in findings may be attributed to factors such as sample size, sample characteristics (e.g., memory clinic vs. community; nationally representative vs. convenience), and the measures used to assess personality and SCI. Although inconsistencies in study results are common in comprehensive systematic reviews (Petticrew, 2015), the differences in findings across the reviewed studies are as intriguing as their similarities. In addition, the current review indicates that much remains to be understood concerning the complex interactions between personality traits and SCI. Considering multiple aspects of an individual's personality (i.e., rather than neuroticism or conscientiousness alone) is likely important to understand factors influencing an endorsement of SCI, both to researchers interpreting study findings as well as to clinicians and those seeking diagnosis or treatment. Individuals with higher neuroticism are often termed the “worried well” (Slavin et al., 2010, p. 707). Although many older adults may adjust to cognitive changes as they age, those with higher neuroticism may focus on each memory lapse, leading to more frequent endorsements of SCI. This idea is supported by previous research demonstrating that individuals high in neuroticism are more sensitive and apt to report somatic symptoms (Costa & McCrae, 1985). Particularly on stressful days, individuals with higher neuroticism are more likely to report SCI than individuals with low neuroticism (Neupert, Mroczek, & Spiro, 2008). Essentially, higher neuroticism may be associated with higher SCI because these individuals are more sensitive to symptoms and report normal levels of cognitive problems as cognitive impairment. However, it is also possible that individuals higher in neuroticism are more hyper-aware of actual, subtle cognitive decline (Pearman et al., 2014; Snitz et al., 2015). In this case, a higher level of neuroticism may be beneficial, leading these individuals to take appropriate action at the earliest indication of impairment (Friedman et al., 2010). Therefore, although the association between SCI and higher neuroticism was supported in the current review, the clinical consequences are not yet understood. Furthermore, neuroticism should not solely be considered independent of other personality traits or individual characteristics. For example, individuals with a high level of extraversion tend to view their cognition more positively (Buratti, Allwood, & Kleitman, 2013), but this effect may be eliminated when accompanied by a high level of neuroticism (Williams, O'Brien, & Colder, 2004). In addition, high neuroticism (Balash et al., 2013; Mandelli et al., 2015) and SCI (Mark & Sitskoorn, 2013; Rowell et al., 2016) have been associated with depressive and anxiety symptoms, which further confounds interpretation of the SCI–neuroticism association. Different approaches to SCI measurement are an important consideration in the current review. When comparing the SCI measures used, results regarding neuroticism remained relatively consistent across studies. However, when examining the relationships among SCI and openness, agreeableness, and conscientiousness, significant relationships were found only in studies that used standardized SCI questionnaires (with the exception of one study). Unlike assessments of personality, there are no standardized, universally accepted SCI measures. SCI may be assessed by an examiner asking the participant a few questions, the participant filling out a questionnaire, or the participant reporting SCI without prompting (Hill, Mogle, Munoz, Wion, & Colancecco, 2015). In their 2015 review, Rabin et al. (2015) found that across 19 studies examining the trajectory of AD, 34 different cognitive self-report measures were used. Such heterogeneity in the assessment of SCI is a noted limitation in the current literature, and refinement of measurement in future research is necessary to better understand the relationships between SCI and clinical outcomes. Self-reported cognition can be a valuable indicator of early cognitive deficit, as it may more accurately reflect the actual impact of subtle decline on everyday life (Garcia-Ptacek et al., 2016). However, self-reported cognition is also influenced by factors including personality, anxiety, and depression. The National Institute on Aging/Alzheimer's Association has recommended the development of measures that are sensitive to slight cognitive decline (Sperling et al., 2011) to facilitate earlier intervention among individuals at higher risk for AD. To achieve this goal, SCI measures should be appropriate for the target population and measure aspects of SCI (i.e., comparing one's current memory performance to earlier life memory vs. comparing one's memory performance to peers) with acceptable sensitivity and specificity (Rabin et al., 2015). Consideration of individual factors, such as personality traits, that may contribute to responses to some SCI assessment items is important for instrument development and refinement. There are several limitations in the current review. First, no limits were placed on year of publication, so the articles reviewed span 30 years, as no previous systematic reviews have been conducted on this topic. However, all articles received either medium or high for each criterion in the WoE framework and thus were pertinent to include in this review. Second, SCI measurements were inconsistent across studies, making it difficult to compare results of each study. A standardized SCI measurement would better facilitate comparisons across studies but is not used in the extant literature. Finally, only three articles reviewed studied the relationship between SCI and personality longitudinally, limiting the ability to draw conclusions regarding associations over time. Future research that uses standardized measures and simultaneously examines the contributions of multiple personality traits on cognitive self-report is needed to clarify the trends identified in this review as well as the inconsistencies. However, the current findings hold important clinical implications for nurses and others who assess older adults' cognitive complaints. The most important of these is that individuals higher in neuroticism (i.e., those who tend toward higher or disproportional negative emotional responses to stressors [e.g., irritability, anger, anxiety, sadness, worry] as well as self-criticism [Costa & McCrae, 1992]) are more likely to endorse SCI. Neuroticism is associated with many poor outcomes, including mental and physical disorders across the lifespan (Lahey, 2009). As depression in older adults may present with cognitive symptoms (Richardson & Adams, 2018), it is critical that SCI among those who tend toward negative emotional responses be thoroughly evaluated, including when no evidence of objective cognitive impairment is detected. Clinically, nurses could consider the impact of memory problems on daily functioning, rather than broad complaints about difficulties with remembering. Identifying older adults at risk for cognitive decline and AD, including those with SCI, requires thoughtful consideration of the individual factors that may contribute to self-report of cognitive problems. The results of the current review highlight the relationships between reports of SCI and personality traits, as well as the study characteristics that may influence these relationships. Consistent with the literature, neuroticism remains an important contributor to perceptions of cognitive health. In addition, most evidence supports the impact of conscientiousness on reports of SCI. However, conscientiousness, openness, and agreeableness are less understood, largely due to the lack of empirical work on these traits. Future research exploring these traits, and reinforcing the previous empirical findings with conscientiousness, is required to fully understand these relationships and ultimately improve the understanding of SCI as a potential indicator of preclinical AD. Well-explained methods and results section; considered participant variables and participants lost throughout the study; large sample size. Methods and results section explained but not as detailed or clear; smaller sample size. Methods and results section poorly explained; flaws in the design of the study. The study was designed and sought to evaluate the relationship between personality and SCI. The study's purpose was not to evaluate the relationship between personality and SCI, but the relationship was still examined as a byproduct of the study. The relationship between personality and SCI was not studied. Used adequate measures to measure personality and SCI. The measurement used for personality or SCI was inadequate. The measurement used for personality and SCI was inadequate. Ms. Koller is Registered Nurse, Penn State Health Milton S. Hershey Medical Center, Hershey, and Dr. Hill is Assistant Professor, Dr. Mogle is Assistant Professor, and Ms. Bang is Graduate Assistant, The Pennsylvania State University College of Nursing, University Park, Pennsylvania. Address correspondence to Olivia M. Koller, BSN, RN, Penn State Health Milton S. Hershey Medical Center, 500 University Drive, Hershey, PA 17033; e-mail: omrunk@gmail.com.